A Mighty Girl's top picks of books and toys for teaching kids about money management. Financial literacy is an essential skill for every child to learn! Money is an integral part of modern life, and whether your child is a preschooler counting coins, an elementary school child saving for a new toy, a tween learning about investing, or a teen budgeting for school expenses or their first full-time job, there are plenty of opportunities to teach kids how to earn, save, spend, donate, and invest. 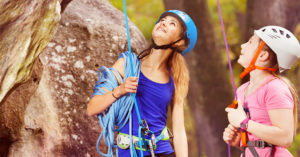 And yet a recent study from the Girl Scouts found that only 12% of girls aged 8 to 17 feel very confident making financial decisions, proof that we need to do more to improve kids' financial literacy. In this blog post, we've showcased our favorite resources to help kids (and maybe parents too!) learn more about money and how to manage it. 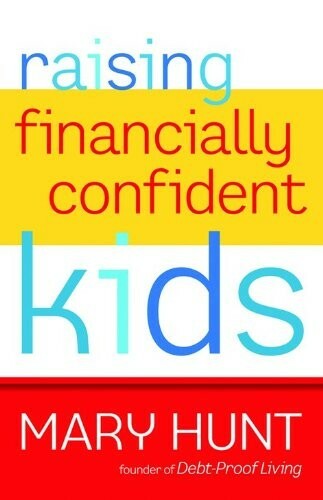 From play money that helps young kids learning to identify coins and bills, to books that introduce concepts like debt, entrepreneurship, and investing to older kids, and even a few titles to guide parents in money conversations, these resources will help you give your Mighty Girl the confidence to manage her money successfully — and use it to plan for her future. Rosa's family's home was destroyed by a fire, and while neighbors are able to provide much of what they need, the one thing that's missing is a big, soft chair to relax in after a long day. 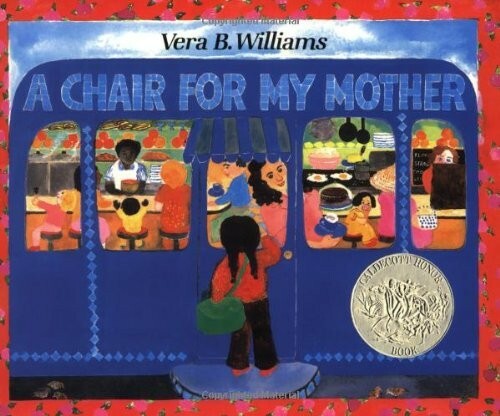 So every day, Rosa, Grandma, and Mama save everything they can in a big jar: Mama contributes her tips from her job as a waitress, Grandma tosses in change when she saves money at the market, and even Rosa puts her few pennies in. Finally, when the jar is full, the family is rewarded with a rose-covered chair, just as comfortable as they've been dreaming the whole time. Kids will root for Rosa and her family as the jar slowly fills, and rejoice when the chair comes home — and look a little differently at the simple pleasures that they enjoy every day. Sister and Brother Bear don't seem to be able to hold onto money for a second — as soon as they get it, they spend it! So Mama and Papa decide to start teaching them the value of money by getting them to earn some themselves. The cubs catch onto the idea quickly, walking pets, picking blackberries, and selling lemonade. When they go a little bit overboard, though, and start going to excessive lengths for a few extra pennies, it's time to teach the kids that money isn't everything — and that sometimes the best thing you can do with your money is give a special surprise to someone you love. 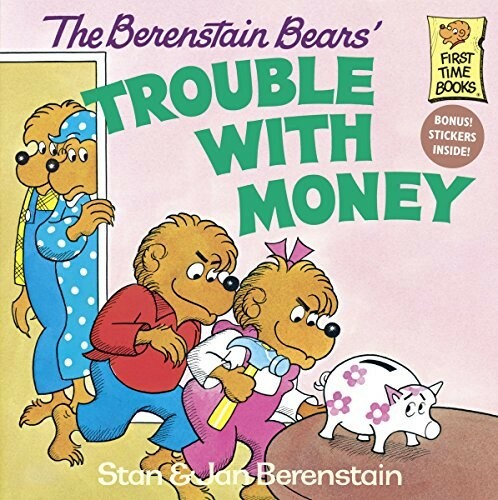 For another book from the same series addressing money management, check out The Berenstain Bears' Dollars and Sense. 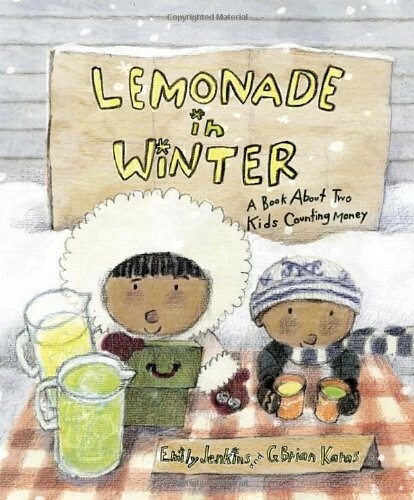 Pauline and her little brother look out the window on a snowy day and get inspired... to set up a lemonade stand! They pool their money for start-up capital, buy some supplies, and mix up some refreshing lemonade and limeade, then start trying to attract customers on their rather empty street. Despite their best efforts, from advertising to entertainment to dramatic sales, they don't make back the cost they invested — but they do make enough for a couple of Popsicles to share. This book is unique in its discussion of the possible failure of a business, providing a great opportunity to talk about forethought and planning when starting a new endeavor. This fun and quirky story also provides a great lesson in resiliency and an encouraging example of two resilient kids who don't let plans gone awry keep them down. 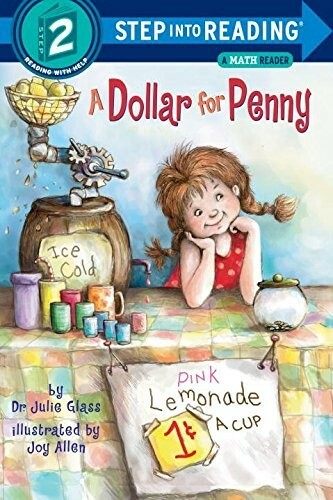 Penny is selling pink lemonade on this beautiful summer's day, preparing to put each coin into her big glass jar bank. Her first cup sells for 1 cent, and she doesn't want to sell herself short, so she raises the price to 2 cents, then 5. Some customers are willing to pay even more! At the end of the day, when she counts all her coins, Penny is thrilled to discover that she's made 100 cents — a whole dollar. This level 2 Step Into Reading book includes pages at the end that show pictures of coins with their denominations, and shows how they add up: five pennies to a nickel, two nickels to a dime, etc. Newly emerging readers will love the rhyming text, as well as Penny's entrepreneurial spirit. 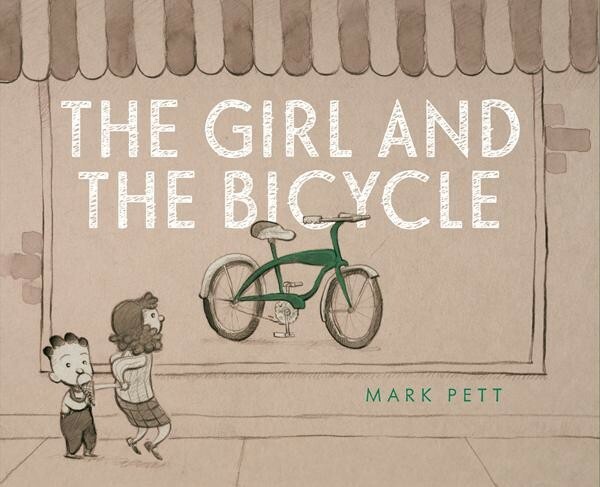 In a shop window, a girl spots the bike of her dreams, but it costs far more than she has saved. Her quest to find ways to earn money leads to a friendly neighbor, who offers her work in the garden. Together, the woman and the girl work side by side until she finally has saved enough — but when she returns to the shop, the bike is gone. 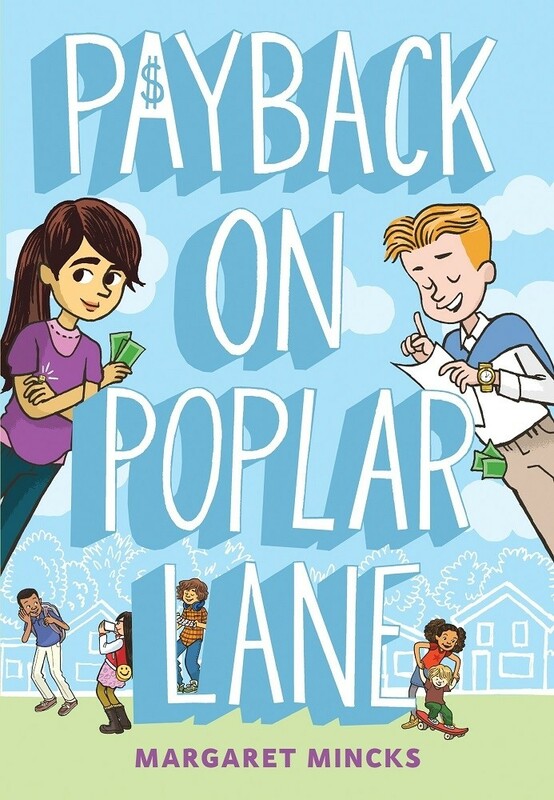 Fortunately, after she uses her savings to do a good deed for her brother, the girl discovers that she’s not the only generous person on her street! This sweet wordless story is a celebration of hard work, cross-generational friendships, and the joy that comes from generosity. 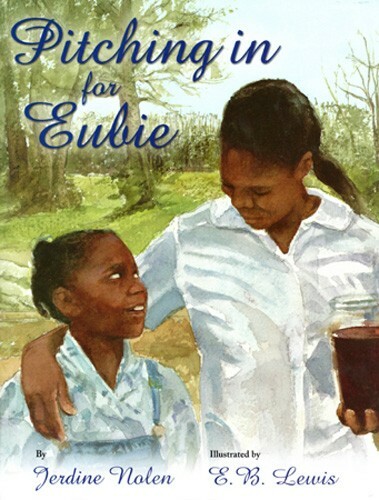 Lily's family is thrilled when her big sister, Eubie, wins a college scholarship — but the scholarship only covers part of the cost, which means the family has to find a way to gather another $3,000 in order for Eubie to head off to school. Everyone else starts taking on extra work to contribute, but Eubie is too young to do most jobs. She takes on chores at home without complaint, but what she really wants to do is add her own few dollars to the family's growing total. Finally, though, her persistence pays off and Lily finds her own way to contribute to the family's cause. This heartwarming story about a family working together to make a dream come true is also a reminder that even younger kids can find their own ways to help. Naima's family is struggling for money, and can't even afford her school fees any more, even though she's won the prize for painting alpanas, traditional patterns used to decorate homes for special occasions. 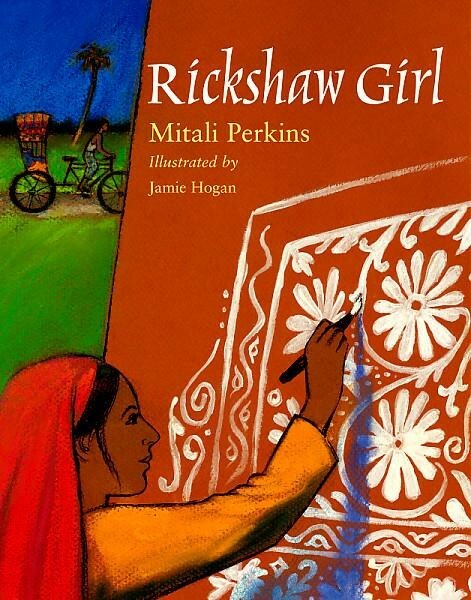 She desperately wants to add to the family's income; if she were a boy, she could take her father's rickshaw — so Naima decides to disguise herself and give it a try. Unfortunately, she crashes the rickshaw, leaving the family in a worse spot than before. In the end, it turns out that her painting ability will be the key to supporting her family — and will even teach her that she could have a future as a business owner. This early chapter book reminds young readers to draw on their strengths, and also provides some quick lessons on what it's like to start and operate a business. 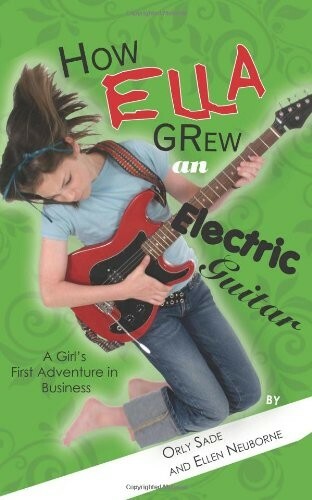 Ella and her friends have formed a band, and what they really need is the powerful sound of an electric guitar. Ella can play, but she only has an acoustic guitar — and her Dad won't replace it, pointing out that it works fine and "money doesn't grow on trees." So Ella sets her sights on saving the $229 she'll need to buy one herself. Savings accounts and stock market investments will obviously be too slow, so it's time to give starting her own business a try. But when she takes a loss on her first day of sales, she starts to question whether she'll ever grow her savings enough to get the guitar of her dreams. 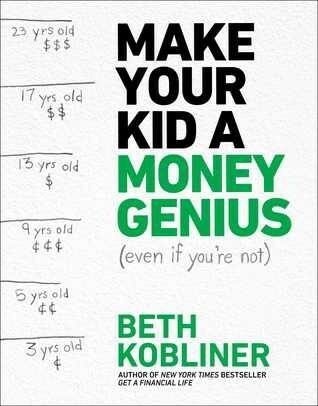 Written by Orly Sade, a professor of finance, and Ellen Neuborne, a former editor for BusinessWeek Magazine, this book introduces tweens to the realities of planning, earning, and saving for bigger goals. 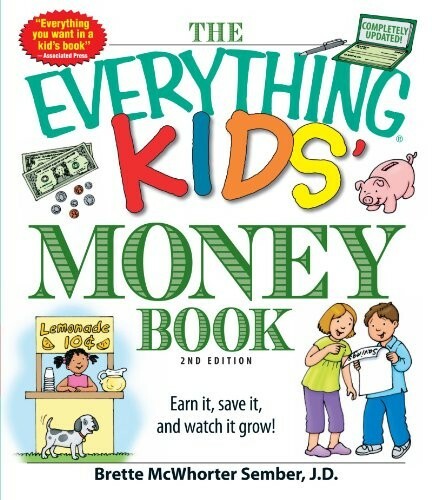 Kids can learn everything from how coins are made to how to invest in the stock market with this handy book! Individual chapters talk about everything from the history of money and banking to assessing needs versus wants to sharing your funds with a well-chosen charity. Fun, accessible sidebars give additional facts, while puzzles and word games scattered throughout reinforce the concepts you're learning. A glossary at the end defines terms financial terms, from allowance to withholding, that kids will use both now and in the future. 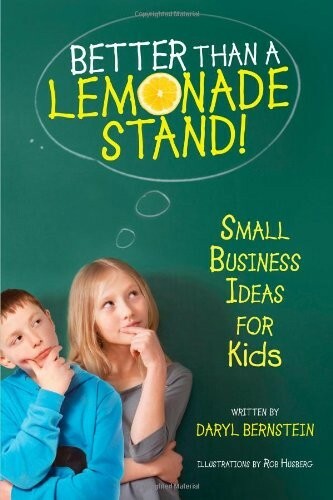 Kids looking for inspiration for a business they can start on their own will love this guide! Daryl Bernstein originally wrote this book as a 15-year-old, and he's since updated it with his experience in the adult world. Bernstein lists 55 different small business ideas, from balloon-bouquet maker to leaf raker to silver polisher, that tweens can take on to make some extra funds. Each business description includes a list of what supplies you would need, how much time the business might take, what to charge, and how to advertise. Plus, general tips help kids determine if they're ready to add the responsibility of a business to their schedule and provide recommendations to make sure you and your business are protected with agreement, contracts, and proper legal operations. Money is a serious subject — but that doesn't mean that learning about it can't be fun or funny! This light-hearted guide covers everything from the history of currency, to what it means to earn, spend, save, and borrow, to what money habits make for long-term money success. 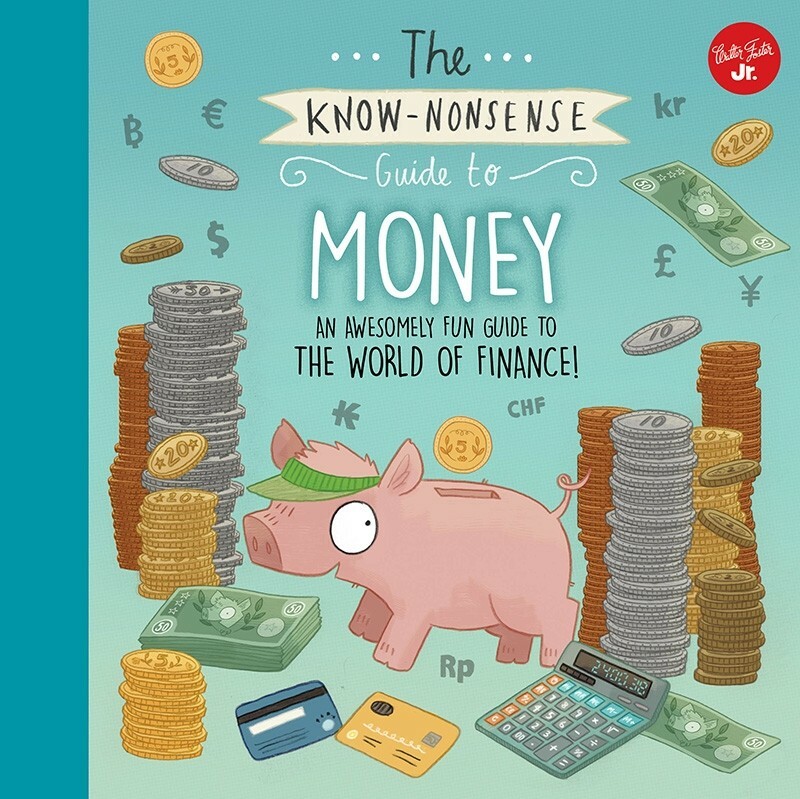 It cheerfully explains money and finances from the ground up, with simple definitions, hilarious examples, and appealing illustrations. It turns out that being a money know-it-all is a pretty useful thing! Are you a spender or a saver? Do you buy what you want as soon as you see it, or figure out if you can get a better deal elsewhere? And do you know what to do if you want to save up for a bigger goal? A Smart Girl's Guide: Money teaches tweens key money and spending skills. Tips on determining your money style, starting your own business, negotiating raises, and even managing money with debit cards are included, as well as useful information for learning how to budget and how to be a savvy shopper so you get the most from the dollars you spend. 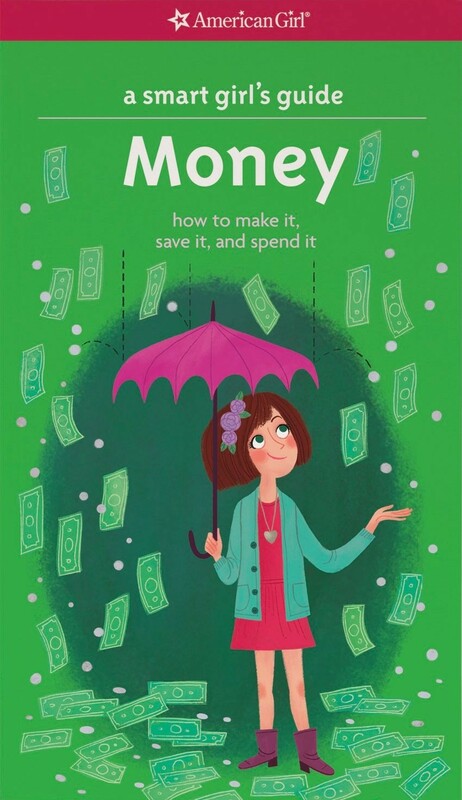 This book from the American Girl Library provides a great guide for tweens who are starting to get into more complex money decisions. With a little work and dedication, any kid can take the money they earn and make it grow. As the authors of this book point out, having a large nest egg (whether you reach that $1,000,000 mark or not) gives you freedom, a sturdy safety net, and the chance to help others. 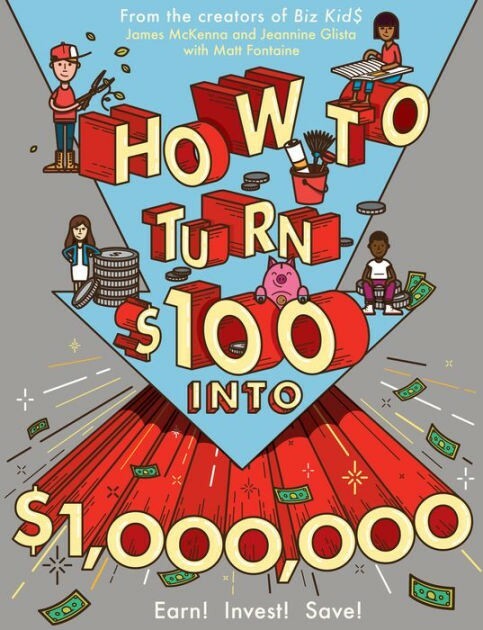 Various chapters emphasize a true millionaire mindset — one that keeps eyes on the prize rather than being swayed by the fads and impulse purchases that tempt you — and teach how to earn money, make that money grow, and then make the best use of the money you've saved. Iinformative and engaging, this book will give your Mighty Girl big financial dreams — and the tools she needs to achieve them. Even small amounts of money invested early can grow to astonishing totals if you have the time to wait! In this guide, the creators of The Motley Fool provide an introduction to investing for teen audiences, demonstrating how being more conservative about spending now can have big payoffs in the future. Individual sections tackle finding great companies to invest in, avoiding financial blunders, and understanding how to prioritize your savings, making sure that you have some fun now but are also prepared for bigger goals later, like college and retirement. Their optimistic tone and helpful suggestions encourage teens to set big goals for their financial futures — and give teens the tools they need to achieve them. Teens can turn their ideas into business that stand the test of time! 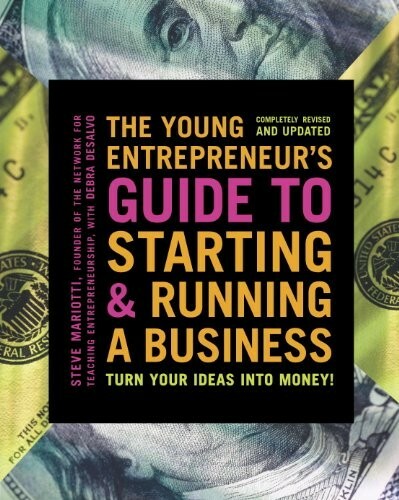 In this book, author and entrepreneur Steve Mariotti teaches teens while being a business owner can be so satisfying — and how to make sure you create a business that works. From the nuts and bolts of creating a legal structure for your business and writing a business plan, to sales strategies and marketing, and even tips on how to grow you business through hiring, expansion, and IPOs, this book covers everything from a part-time business for a little extra spending money to a company that becomes your career. Along the way, stories of real entrepreneurs provide plenty of inspiration and the reassurance that you can do it too. In order for kids to play with money, they need some! 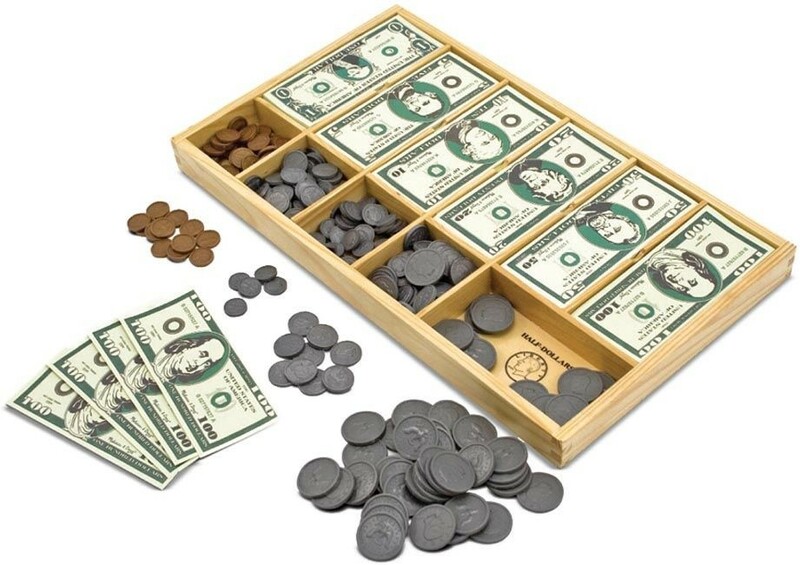 This set of play money from Melissa and Doug comes in a wooden cash drawer for easy sorting and organization. Fifty of each denomination of both coins and bills means there’s more than enough here for multiple kids to play, or for stocking the cash drawer of a play store. Kids can practice totaling funds, making change, and more. 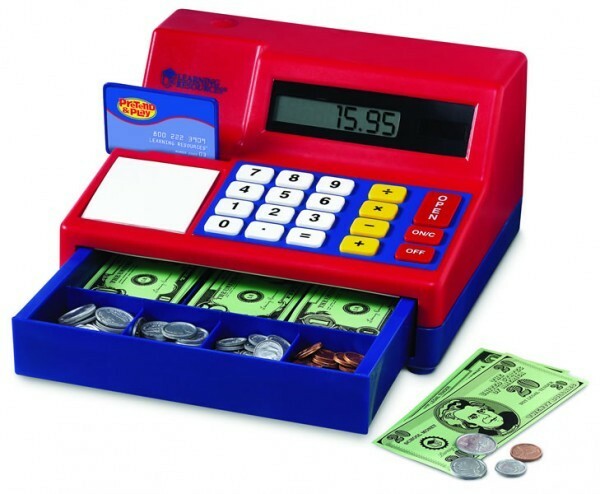 When you buy things at a store, the cashier uses a cash register — so why not pick up a play cash register that works as a real calculator? This solar-powered cash register’s buttons really work and allow kids to work with decimals as well as whole dollars so that it feels like a real-life cash register. Thirty play bills and forty plastic coins come with it for paying and making change, and it includes a plastic credit card that beeps when you slide it. 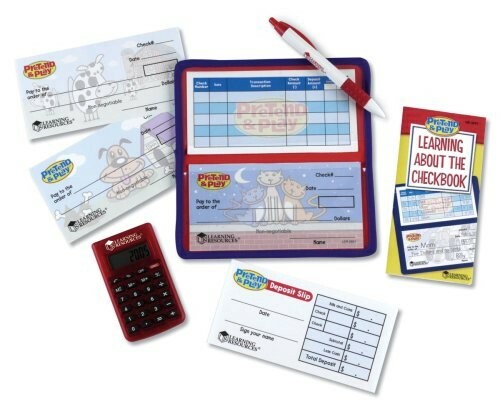 Kids can practice balancing their bank account with this pretend checkbook that comes with a kid-friendly calculator. Kids will get pretend checks, deposit slips, and even a check register so they can track incoming and outgoing funds, either as part of pretend play or as a way of reinforcing activities you do with allowance money. The solar powered calculator will help her total everything up. This set comes with 25 checks, a few deposit slips, and a check register; you can also get refill packs that include more checks, deposit slips, and register pages to extend the fun! 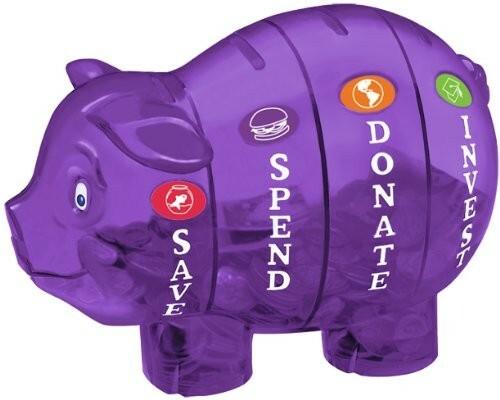 Piggy banks are a classic savings tool, but this Money Savvy Pig updates the idea with four compartments, one each for spending, saving, investing and donating! Each of these compartments empties independently, so kids can set money aside for different goals and keep their categories separated. This bank comes in four translucent colors (pink, green, blue, and purple) and there's also an option of an opaque platinum pig. An included booklet provides some information for parents and kids about the different categories, and there's also a sticker sheet to remind kids of their plans for their savings, donations, and investments. This compact divided bank helps kids learn about the three key categories of money: spending, saving, and donating. 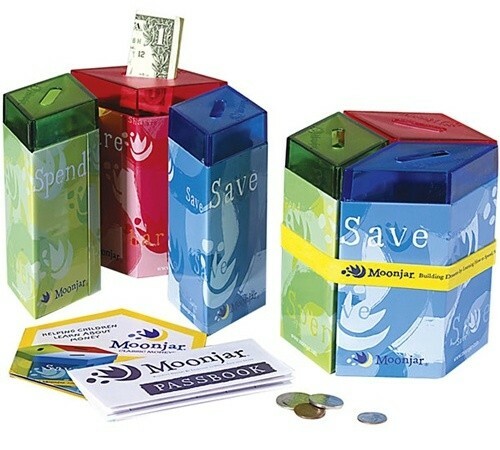 Three tin moneyboxes, each a different color, nest together to easily sort your child's money. Since the compartments are easy to open and close, kids can deposit, withdraw, and count their funds easily. An included passbook lets kids track transactions, making it clear how the money they have available goes up and down as they choose to make purchases, and a family guide provides suggestions for having money conversations with kids. 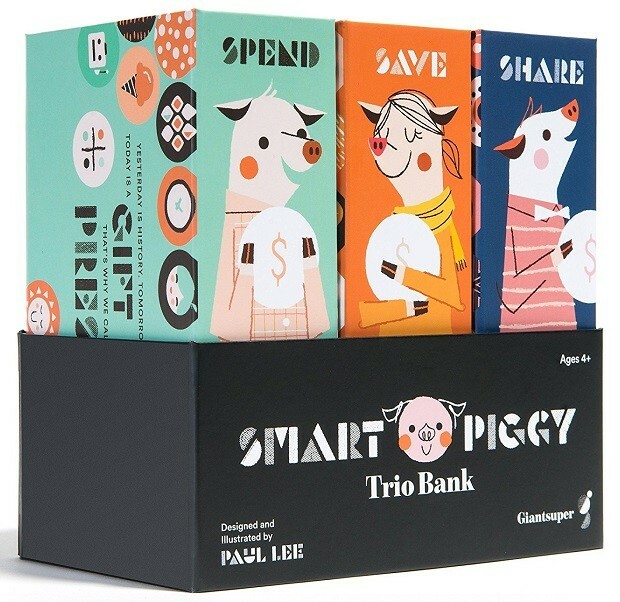 This colorful trio bank provides three compartments for saving, spending, and sharing. Each compartment features a thoughtful quote about that money activity — so, for example, the “Share” box reads, “We make a living by what we get, but we make a life by what we give.” Individual ledgers for each box allow kids to track their deposits and withdrawals and watch their cash flow. Add in the included Kid’s Guide that explains basic money concepts, and there’s enough here to give her a great financial start. These colorful flash cards help kids build quick recognition of coin denominations, as well as total values of groups of coins. Each full-color card provides an image on one side and the answer on the other -- so two dimes, two nickels, and three pennies? Thirty-three cents. The coin cards are paired with time flash cards featuring an analog clock on one side and the digital equivalent on the other. 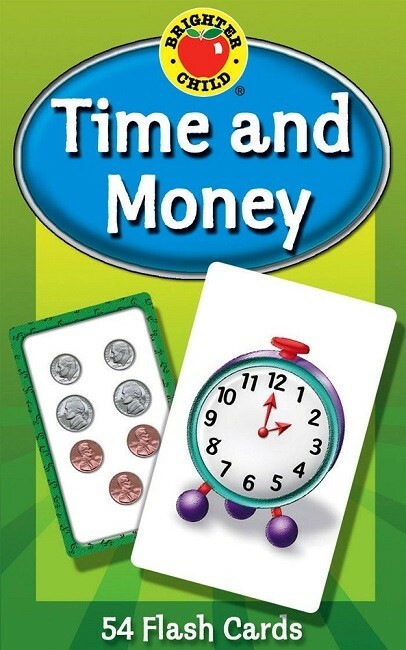 Plus, a special card included in the deck features activity ideas to turn learning coins and clocks into a fun game, either one-on-one or in a classroom setting. 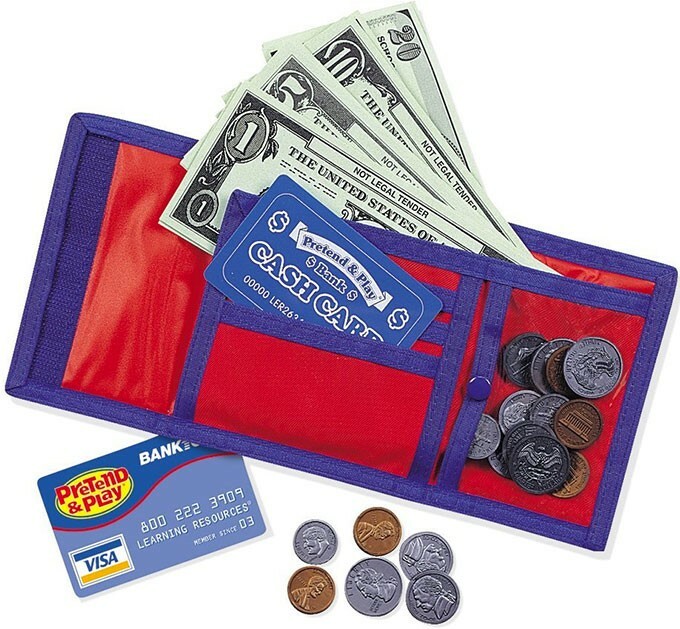 Kids can pretend to buy, sell, and shop with this great play wallet set! This nylon wallet with a Velcro close looks just like the real thing — it even has an ID window — and comes with play money (30 bills and 40 coins in a variety of denominations) and even credit and bank cards. An included activity booklet provides ideas to help parents and teachers encourage kids to develop fluency with money and understand how it works in the real world. It's all about currency conversion in this board game! As kids land on squares that allow them to collect money, they'll have to follow the directions on the spinner — sometimes you can take your money in any combination of coins, but sometimes you'll have to avoid nickels, dimes, or quarters, giving kids plenty of chances to use their addition, subtraction, and multiplication skills and to remember the values of the coins. When you land on a Bank Exchange space, you get the chance to change up your currency to consolidate your funds. 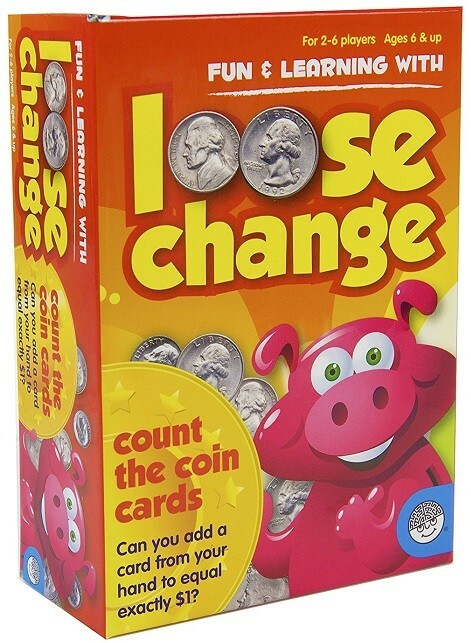 It's a great way for kids to practice their money changing skills. The buck stops with this game, where the goal is to play cards to get a total of one dollar! Each of these cards is worth from five to fifty cents, and you’ll have to be strategic as you play — break the bank by exceeding your dollar total and you go bust and have to put those cards aside. If you’re worried about going bust, you can play a “save” card and skip a turn...whoever has the most dollars at the end of the game wins! This easy-to-play game for two to six players is a fun way to practice totaling coins. This two-games-in-one box provides money practice while also teaching kids about one of the basics of finance: paying bills! 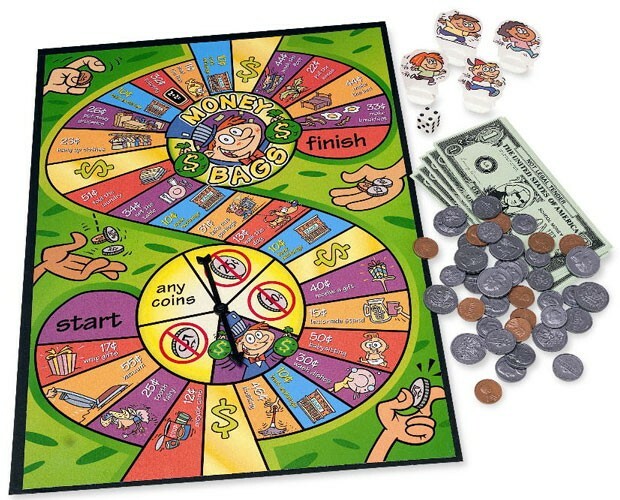 The first level of play, Bill Maker, teaches kids to count and add paper money; then, the second level, Bill Breaker, introduces budgeting, saving, and making change. Real-life budget items like insurance and taxes get mixed in with commons "wants" like a new bike, to help kids understand that a family's money has to cover both. This game is only lightly competitive, encouraging kids to focus on the financial skills they're learning, and will help kids recognize the many expenses that day-to-day life entails. 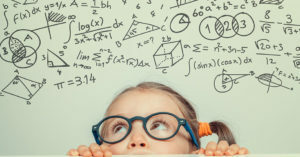 Parents often assume that kids have to be older before they're ready for "the money talk," but research shows that kids can start learning basic money concepts as young as preschool ages — and that basic money habits can be formed as young as seven. This book provides a guide to creating an on-going, age-appropriate money conversation that grows with your child, teaching delaying gratification, working hard, living within your means, and giving generously to others. Fun and accessible, this encouraging book will help you pass on solid financial principles even if you've struggled with your own financial situation from time to time. 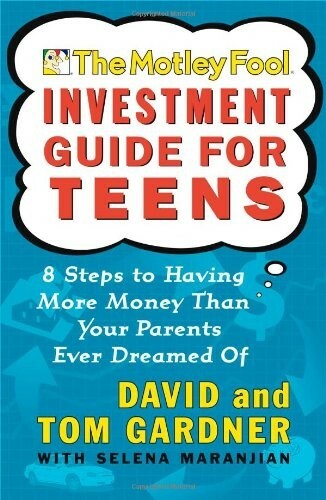 This book gives you a developmental map for teaching kids to be financially fit, from ages 5 to 18. 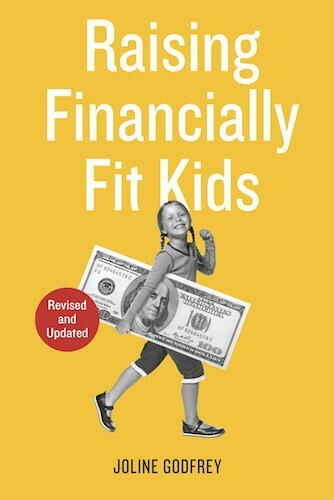 Author Joline Godfrey, an expert in kids, parents, and money, provides a list of ten key money skills that kids need to know before they reach adulthood, including saving for goals (or a rainy day), negotiating what you're worth, following entrepreneurial spirit, and even using money to change the world. Her core message is that money is a tool that allows you to be independent, not something to be accumulated for its own sake, and that kids must learn to live within their means and share their wealth with those less fortunate. Encouraging and easy to follow, this developmental map will help you ensure your child enters adulthood ready to be financially independent. 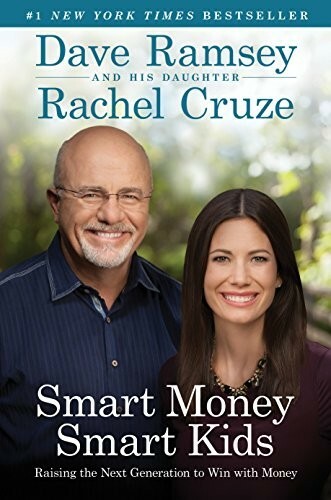 In this best-selling book, financial expert Dave Ramsey and his daughter Rachel Cruze talk about how parents can teach kids to avoid financial pitfalls — even ones they themselves have made. Ramsey is upfront about his own mistakes, drawing on too much debt and living a lifestyle that couldn't be sustained on his income alone, while Cruze provides the perspective of a child who didn't make those mistakes because her parents provided her with good guidance. Together, they address how to foster a positive attitude towards work and saving; teaching budgeting in age-appropriate ways; and how to instill a sense of appreciation and gratitude, even in kids who grew up with everything. Financial expert Mary Hunt knows the consequences of poor money management, and now she teaches parents around the world how to raise kids to be savvy, responsible, and confident about their money. A major focus of her book is talking about the pitfalls of marketing and debt, especially in a world where everyone seems to pull out a credit card at the drop of a hat. Individual chapters talk about money matters for different age groups, including preschool, ages six to nine, and ages ten and up. It's a straight-forward and common sense guide to teaching kids confidence with money, even if you're not always confident yourself. Money conversations can also provide a great opportunity to communicate family values about money and giving. This insightful parenting book shows how families of all income levels can talk with kids about money issues, not only to teach them about financial responsibility, but also to show them how the family's choices allow them to give to their community. While exploring topics from the Tooth Fairy to birthday parties to college tuition, parents learn how to encourage the opposite of being spoiled, instead fostering less materialism and more generosity. 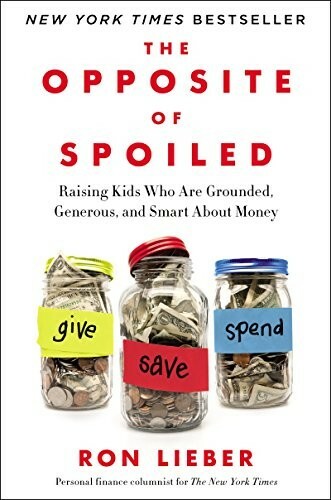 Author Ron Lieber's examination of the attitudes we communicate to kids about money will help parents teach that money is a tool, not a goal, and that the reward comes from how you use it. For a selection of books about careers, entrepreneurship, and money management, visit our Jobs & Money Collection. 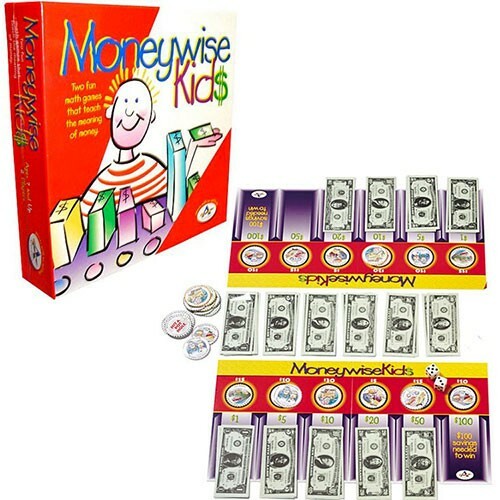 For more toys that teach financial skills, visit our Money Management Toy Collection. For more books about raising financially capable kids, visit our Financial Management Parenting Collection.